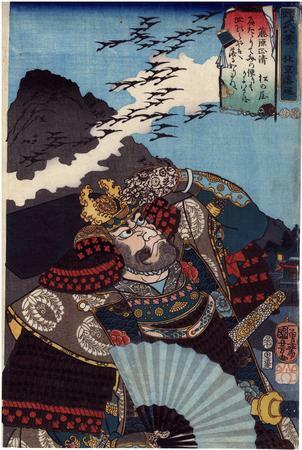 "The Japanese general Katō Kiyomasa (1562-1611), here depicted during his Korean campaign of 1592, pines for home as he watches a flock of geese in flight. In that it was forbidden to depict historical figures from the late 16th century, that of Kiyomasa is disguised a Masakiyo of the aristocratic Fujiwara family. A knowing public, though, would have understood the actual identity of the character. This illustration relates to Homing geese at the Northern capital from the Eight views." Quoted from: Heroes and Ghosts: Japanese Prints by Kuniyoshi 1797-1861 by Robert Schaap, p. 108, with a color reproduction. Illustrated in color on page 140 of Andreas Marks' Japanese Woodblock Prints: Artists, Publishers and Masterworks 1680-1900.